Route 66 — we’ve all heard of it, but few know what it entails. Considered the most popular road in North America, Route 66 stretches from Chicago to Los Angeles and everywhere in between. Thinking of traveling Route 66? You should plan to travel through as many states as you can! Here are some sights not to miss during your travels. Located in Amarillo, Texas this “ranch” is probably the most unique ranch you’ll be able to find in the United States. Home to old Cadillac cars that have been planted in the ground. Though this ranch lacks animals, it makes up for it in uniqueness. Visitors are encouraged to use the cars as graffiti pieces, so take a few minutes to check out every single one. Home to the World’s Largest Concrete Totem Pole, this 14-acre park boasts eleven totem poles of all different sizes. The brainchild of a retired art teacher, these totem poles are built using steel, concrete, sand, and rock. Meant to inspire young kids to learn more about Native American culture, this park is an interesting place for young and old alike. There are a lot of random museums out west, and this one is no different. You’ll find vintage gas station memorabilia, original gas station pumps, wooden phone boots, and black and white photos from the 1950s in this refurbished gas station. Since Route 66 officially starts in Chicago, it is only appropriate that you visit this site which is right outside the city. It is also a good stop for history buffs, as this was the place of Barack Obama’s election acceptance speech. Looking for something to stay overnight before you catch one of your buses? A night here in Holbrook, Arizona will be one to remember! There are only three tepees available at the motel, so make sure you call ahead! 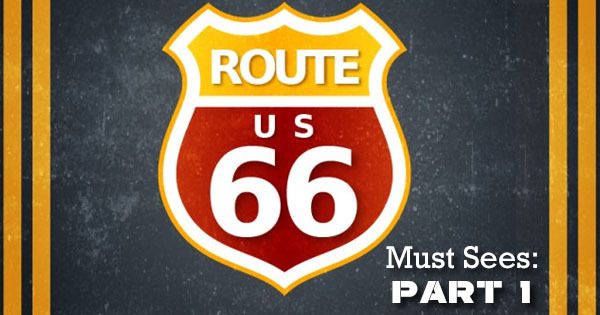 Need to figure out a way to get to all these stops on Route 66? Take charter bus tours! Buses are a great way to see the country, and they are quite popular as they amount for 751 million passenger trips annually! These buses are good for the environment, as every coach bus has the potential of removing 55 autos from the highways, while emitting less carbon dioxide per passenger mile as compared to any other form of transportation. Be sure to look out for part two in our Route 66 series !